After another weekend of yellow vest violence and disorder, notably in central Paris, the French papers are dominated by pictures of street fighting and by debates about policing, protestors and the alleged theft by law-enforcement agents of Paris St Germain football jerseys. This was Act 18 of the popular protest movement which started last November. The papers are not sure who to blame for the chaos. “Police strategy criticized” reads a front-page headline in centrist Le Monde. “A dead-end” says left-leaning Libération, lamenting a security system which has run out of steam and a government which has run out of ideas. Well over three-quarters of those readers of right-wing Le Figaro who cast a vote in the conservative paper's daily poll believe the time has come to ban all further demonstrations from the capital's show-piece shopping street, the Champs Elysées. The idea is apparently being considered by the French president, Emmanuel Macron, in the wake of Saturday's acts of vandalism targeting famous venues like the chic café-restaurant Fouquet's or the luxury handbag seller Longchamp. The obvious danger is that, if the police do close the Champs Elysées for future protests, the so-called “casseurs” or “smashers” will simply shift their field of operation. There are plenty of fancy targets in central Paris. Even, or perhaps especially in view of the impact of the violence on French business and tourist potential, the financial daily Les Echos gives pride of place on its front page to Saturday's Paris violence. The business paper hopes for a strong and clear response from Prime Minister, Edouard Philippe. Today's editorials are classic expressions of comfortable intellectual shock in the face of violence which no one seems to understand. The editorial in Les Echos is headlined “Enemies of the people.' 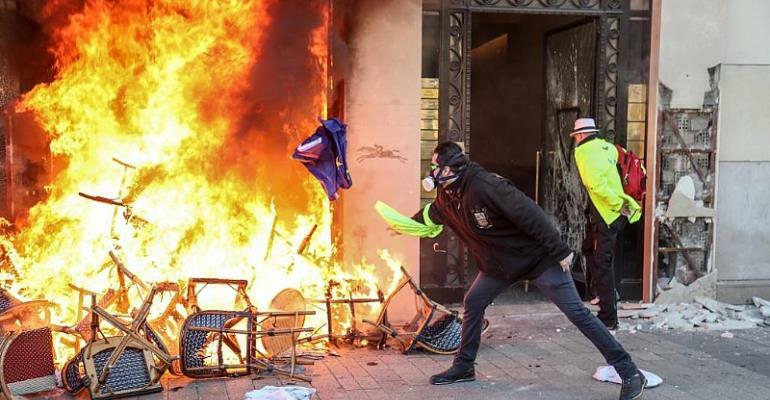 The article assures us that France is on the verge of a sort of radical tyranny, with a handful of criminals, anti-semites and hot-heads threatening social and political stability. This is no longer a respectable protest movement, says Les Echos, it is a sickening combination of hatred and illegality. Worse, says the financial daily, none of the key figures who have come to represent the yellow vest movement has had the courage to speak out against another display of mindless violence. Le Figaro's editorial speaks of “indignation, shame and revulsion”. This is the sort of thing our right-wing colleagues do so well. France is not a country ravaged by famine, the editorial fulminates, nor a dictatorship. And those gilets jaunes who think that gratuitous and stupid violence is the way forward are doing fatal damage to their movement. This, despite ten billion euros in government hand-outs and thousands of hours of national debate. Le Figaro has no doubt: Saturday's violence was perpetrated by fanatics from the extreme left. But the yellow vest organisers have to take responsibility for allowing their “ultimatum” protest to be invaded by the vandals who want to crush capitalism. The editorial headline in left-leaning Libération is the single word “Rage”. Libé contrasts the peaceful demonstration against climate change with the yellow storm which tore through central Paris on Saturday. The president has said that it is now clear that additional, tough measures must be taken. He has been meeting his interior and justice ministers today to discuss what else can be done. But, says Libé, Emmanuel Macron is barking up the wrong tree. The problem will not be resolved by more police officers, more tear gas, new and more offensive crowd-control weapons. What is needed, says the left-wing daily, is more constructive dialogue and a commitment by the government to greater social and financial justice. The battle lines have been drawn. But the skirmishing in the streets can not be won by the authorities. Additional, tough measures must, indeed, be taken. But Emmanuel Macron earlier today may have been talking to the wrong ministers. Did a Paris police officer steal a PSG training outfit? Which brings us to the strange case of the stolen football gear. One of the prime commercial targets on the Champs Elysées was the shop run by the Paris St Germain football club. The windows were broken in the course of the initial violence. Later in the afternoon, a journalist from the on-line agency Brut filmed a Paris anti-riot policeman folding blue and white long-sleeved clothing, before putting items into a back-pack. Then another police officer arrived and attacked the journalist with his baton. The police internal investigation and disciplinary body, the IGPN, has opened an investigation.